Projects that light up Newcastle’s stunning harbour make up some of the successful applications in Round 4 of the 2018 Newcastle Port Community Contribution Fund. Parliamentary Secretary for the Hunter Scot MacDonald MLC announced that five new community infrastructure projects would benefit from the Round 4 Fund, with a total value of $1.35 million going into projects to enhance the port-side areas for the community. “I am pleased to announce that a good mixture of community activation and port-side infrastructure works make up this year’s successful projects,” Mr MacDonald said. “The $1.35 million will be awarded to Projecting Newcastle, Cottage Creek Beautification, Seafarer Volunteer Service, Camp Shortland Precinct Activation, and Lightscape. “The largest single grant this year is $450,000 towards Hunter Water’s work to explore Cottage Creek Beautification – Bank Amenity Works. Pending environmental investigations, community engagement, design and approvals, the project could see new vegetation, open areas and promenades introduced along the stormwater channel, stretching from the rail line to Honeysuckle Drive.” Hunter Water’s Managing Director Jim Bentley said Hunter Water welcomed the $450,000 grant. “This grant will allow Hunter Water to continue its exploration of the liveability and public amenity benefits of naturalising the existing Cottage Creek channel, and allow us to work with our communities and stakeholders to finalise design, environmental investigations and approvals,” Mr Bentley said. “There are also two separate lighting/projection projects that will add attractive activation to the harbour, with the University of Newcastle successful with its Honeysuckle Lightscape project and GrainCorp successful with its Projecting Newcastle initiative,” Mr MacDonald said. These will use state-of-the-art laser technology to project images and video onto some of Newcastle’s iconic structures and landscapes, providing safe night-time attractions to bring people into the city after dark. 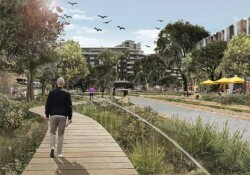 In addition to this, the city will benefit from significant infrastructure improvement with Newcastle City Council’s Camp Shortland Precinct Activation that involves temporary infrastructure improvements to the Camp Shortland site, including children’s play areas, walkways, seating and exercise equipment.